As far as open-source protocols go, one area in which Bitcoin is unique is the sheer difficulty of making any changes to the protocol. Unlike most other protocols, where features can be added, modified or deprecated at a moment\\\\\\\\\\\\\\\\\\\\\\\\\\\\\\\\\\\\\\\\\\\\\\\\\\\\\\\\\\\\\\\'s notice, in the world of Bitcoin even the slightest change requires the simultaneous cooperation of the vast majority of the entire Bitcoin network. The reason for this is simple: in Bitcoin, and in Bitcoin alone, absolute consensus is required. On internet protocols like HTML and CSS, if a web browser interprets some style elements incorrectly, the worst that can happen is that the webpage renders incorrectly. In Bitcoin, on the other hand, a single transaction being incorrectly valid or invalid makes the entire block invalid, potentially causing the entire network to split in half as it did in March 2013. As a result, most of the decisions that Satoshi Nakamoto made in 2008 we are essentially stuck with. Although Satoshi\\\\\\\\\\\\\\\\\\\\\\\\\\\\\\\\\\\\\\\\\\\\\\\\\\\\\\\\\\\\\\\'s choices were by no means perfect, fortunately it appears that he has been right more often than not; in fact, there are several instances in which we are all better off for the choices Satoshi made for reasons that even he did not imagine. But what is the relationship between these two values? The answer lies in a branch of mathematics known as public key cryptography. Although the term cryptography is usually associated with the art of securely sending secrets, public key cryptography is actually even more often employed for another purpose: authentication. For example, suppose that a software company wants to send an update to all of its users, but wants to do so securely, so that others cannot publish fake updates containing computer viruses. With public key cryptography, the software company can create a key pair, consisting of a private key and a public key, and include the public key in the software. When the company sends out an update, it digitally signs the update using a cryptographic digital signature algorithm with its private key, and the clients, upon receiving the update, can verify the validity of the signature using their copy of the public key. If an attacker, without knowledge of the software company\\\\\\\\\\\\\\\\\\\\\\\\\\\\\\\\\\\\\\\\\\\\\\\\\\\\\\\\\\\\\\\'s secret private key, tried to make a fake update, the signature would fail to verify, and even if the attacker modified a legitimate update in transit the signature would also fail to verify. 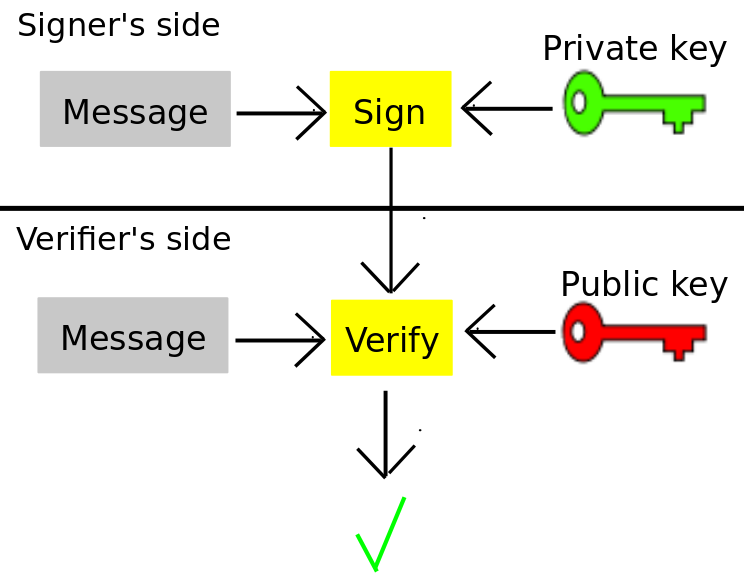 One can see how this can be used in a Bitcoin-like currency: everyone publishes their public keys, and sending from A to B requires A to sign a message containing B\\\\\\\\\\\\\\\\\\\\\\\\\\\\\\\\\\\\\\\\\\\\\\\\\\\\\\\\\\\\\\\'s public key with his private key. From this, the protocol would be able to infer that A authorized a transaction sending some money to B. So how do transactions work? Aside from the obvious information about the transaction itself, a Bitcoin transaction contains two things: the spender\\\\\\\\\\\\\\\\\\\\\\\\\\\\\\\\\\\\\\\\\\\\\\\\\\\\\\\\\\\\\\\'s public key, and a signature made with the spender\\\\\\\\\\\\\\\\\\\\\\\\\\\\\\\\\\\\\\\\\\\\\\\\\\\\\\\\\\\\\\\'s private key. Anyone verifying the transaction checks (1) that the hash of the public key is the spender\\\\\\\\\\\\\\\\\\\\\\\\\\\\\\\\\\\\\\\\\\\\\\\\\\\\\\\\\\\\\\\'s address, and (2) that the signature verifies with the public key. Taken together, these facts are a proof that the transaction was made (or authorized) by the owner of the private key corresponding to the spender\\\\\\\\\\\\\\\\\\\\\\\\\\\\\\\\\\\\\\\\\\\\\\\\\\\\\\\\\\\\\\\'s address. Not really that much longer than the addresses we use today. So did Satoshi\\\\\\\\\\\\\\\\\\\\\\\\\\\\\\\\\\\\\\\\\\\\\\\\\\\\\\\\\\\\\\\'s choice simply introduce unnecessary complexity and waste? As it turns out, the answer is no. There is another very good reason to use the hash-of-public-key address construction: quantum cryptography. Quantum computers are capable of breaking elliptic curve DSA (ie. given a public key, a quantum computer can very quickly find the private key), but they cannot similarly reverse hash algorithms (or rather, they can, but it would take one 280 computational steps to crack a Bitcoin address, which is still very much impractical). Thus, if your Bitcoin funds are stored in an address that you have not spent from (so the public key is unknown), they are safe against a quantum computer - at least until you try to spend them. There are theoretical ways to make Bitcoin fully quantum-safe, but the fact that an address is simply a hash of a public key does mean that once quantum computers do come out attackers will be able to do much less damage before we fully switch over. 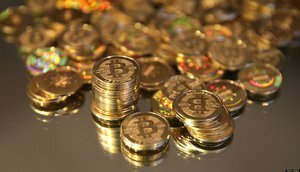 One somewhat controversial property of Bitcoin is its fixed currency supply. There are currently 25 BTC being generated every 10 minutes, and this amount cuts in half every four years. All in all, there will never be more than 21 million BTC in existence. On the other hand, each bitcoin can be split into 100 million pieces (called "satoshis"), so it will not become difficult to use Bitcoin if its value goes up the same way it would become problematic to trade with dollars if each penny was enough to buy a car. Thus, all in all, the total number of currency units that will ever exist stands at 2,100,000,000,000,000: 2.1 quadrillion, or about 250.899. In choosing this figure, Satoshi was much luckier, or wiser, than most people realize. First of all, the number is considerably less than 264 - 1, the largest integer that can be stored in a standard integer on a computer - go above that, and the integers wrap around to zero like an odometer. Notice how scientific notation allows you to express all of these values with reasonable accuracy despite their wildly varying scales. Floating point notation is essentially scientific notation in binary; when you store the number 9.625, your computer stores "1.001101 * 1011" (or rather, it stores 01000000 00100011 01000000 00000000 00000000 00000000 00000000 00000000, which is the same thing in high-precision serialized form). In this high-precision form, the "significand" (the part that\\\\\\\\\\\\\\\\\\\\\\\\\\\\\\\\\\\\\\\\\\\\\\\\\\\\\\\\\\\\\\\'s not the exponent) has 52 bits. What this means is that high-precision (more precisely, "double precision") floating point numbers are good enough to exactly store integers up to 253, but not higher - if you go higher, you start lopping off digits at the end. Bitcoin\\\\\\\\\\\\\\\\\\\\\\\\\\\\\\\\\\\\\\\\\\\\\\\\\\\\\\\\\\\\\\\'s 250.9 satoshis are, in exponential terms, just below this maximum. Note that Stefan Thomas in his BitcoinJS library did not take advantage of this, so that library uses a specialized "big number" object instead of a plain number to store transaction output values. When asked about this, Thomas replied that he realized that using regular numbers was possible, but BitcoinJS needed to include the "big number" library regardless, since elliptic curve arithmetic requires numbers up to 2512, so the choice was arbitrary. My own BitcoinJS fork (which also adds other improvements) does use plain numbers to store the number of satoshis, a decision motivated largely by the desire to be compatible with external sources of transaction output data such as sx and pybitcointools. Essentially, to add two points P and Q, trace a line between them, locate the other point on the curve that the line intersects, and trace a vertical line from that point to get your answer. However, for cryptographic purposes these ordinary elliptic curves have a weakness: they\\\\\\\\\\\\\\\\\\\\\\\\\\\\\\\\\\\\\\\\\\\\\\\\\\\\\\\\\\\\\\\'re imprecise. If you do very many point additions, floating point rounding errors will slowly accumulate, and eventually the result will be entirely meaningless noise. 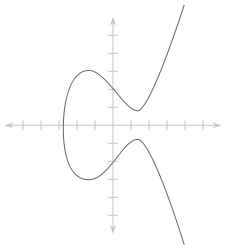 Thus, elliptic curve cryptography uses an elliptic curve with two modifications. First, the equation is now y2 = x3 + ax + b + kp, where k can be any integer and p is some large prime number (a parameter of the curve alongside a and b). Second, x and y must be integers. Although the resulting set is hardly a "curve", surprisingly enough the same math still works, and the restriction to integers avoids rounding errors. The obvious question is this: where did the seed come from? Why was the seed not chosen to be some more innocent-looking number, like 15? In light of recent revelations regarding the US National Security Agency subverting cryptographic standards, an obvious concern is that the seed was somehow deliberately chosen in order to make the curve weak in some way that only the NSA knows. Thankfully, the wiggle room is not unlimited. Because of the properties of hash functions, the NSA could not have found one "weak" curve and then gone backward to determine the seed; rather, the only avenue of attack is to try different seeds until one turns out to generate a curve that is weak. If the NSA knows of an elliptic curve vulnerability that affects only one specific curve, the pseudorandom parameter generation process would prevent them from standardizing it. However, if they knew of a weakness in one in every billion curves, then the process offers no protection; for all we know, c49d360886e704936a6678e1139d26b7819f7e90 could have been the billionth seed that the National Institute for Standards in Technology tried. That\\\\\\\\\\\\\\\\\\\\\\\\\\\\\\\\\\\\\\\\\\\\\\\\\\\\\\\\\\\\\\\'s it. And even p is quite simple to generate; it\\\\\\\\\\\\\\\\\\\\\\\\\\\\\\\\\\\\\\\\\\\\\\\\\\\\\\\\\\\\\\\'s only 2256 - 232 - 977 (in the interests of fairness, p and a in secp256r1 are also fairly simple; it\\\\\\\\\\\\\\\\\\\\\\\\\\\\\\\\\\\\\\\\\\\\\\\\\\\\\\\\\\\\\\\'s b that\\\\\\\\\\\\\\\\\\\\\\\\\\\\\\\\\\\\\\\\\\\\\\\\\\\\\\\\\\\\\\\'s problematic). The simplicity of these parameters gives the NSA / NIST very little wiggle room to create a deliberately bad curve. And even the specific values of 0, 7 and 977 can be justified by security and efficiency constraints, so the chance that Bitcoin\\\\\\\\\\\\\\\\\\\\\\\\\\\\\\\\\\\\\\\\\\\\\\\\\\\\\\\\\\\\\\\'s elliptic curve parameters were chosen with any malicious intent is very low indeed. When Dan Brown, the current chairman of the Standards for Efficient Cryptography Group, was asked about this, he replied: "I did not know that BitCoin is using secp256k1. Indeed, I am surprised to see anybody use secp256k1 instead of secp256r1." If secp256r1 is actually compromised, then since Bitcoin is one of the few applications that is using secp256k1 instead of secp256r1, Bitcoin has truly dodged a bullet.